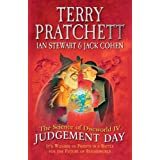 Judgement Day: The Science of Discworld IV by Terry Pratchett with Ian Stewart & Jack Cohen. This is a fusion of fiction and nonfiction, alternating Pratchett's short story chapters with science and history discourses on wide-ranging subjects, and comparing Discworld with Roundworld (Earth). I have never read anything quite like it. Not what I expected at all. Fascinating! I'm amazed at how much was packed into the book and how interesting it was to read it. Expect to take some time reading it. The science is slower going than the story. "As we came to understand our world more deeply, and asked new questions, comfortable answers in terms that we could intuitively understand began to make less and less sense." Majorie Daws arrives in Discworld, a wizardly experiment gone wrong. "One of the big puzzles about causality is that once you start to trace the causes of even the simplest features of the world, you find an ever-branching backward tree, with many unlikely things coming together at just the right instant to make something else happen. We rest on an infinite pile of coincidences, and the pile gets wider the further back we go. The probability of anything specific happening seems to be zero." "Life has lifted itself out of the simple laws of nature, where it started, and is now a whole complex world, at least as different from that origin as a modern aeroplane is from a flint axe. The scene at the beginning of the film 2001, where the ape throws up a thighbone and it morphs into a space station, is a lovely illustration of just that kind of evolution. And that transformation is minor, compared to how life has transcended its origins." "Within that world [complexity of biological evolution], one of its beasts has acquired language, imagination, and a penchant for stories: a special, wholly new thing in the cosmos. Narrativium has escaped from Discworld into Roundworld; now some things do happen because there is a creature that wants them to." "Each new capability causes a particular technological path to branch, leading to new roads. Stuart Kauffman, one of the founders of complexity science, introduced the term 'the adjacent possible' to mean the possible behaviours of a complex system that are just a short step away from wherever it currently is. The adjacent possible is a list of what potentially might develop. In a sense, it is the system's potential." "[Besides imagining other possibilities] The other trick that minds can do to improve technology is to copy: to take a technical trick used in one invention and to spread its use to others." Much discussion of origin, shape and movement of the universe. Recent new data adds more questions and discussion, not answers. "Most sane, rational human beings learn quite early on that you feel just as certain even when you're wrong; the strength of your belief is not a valid measure of its relation to reality. If you have scientific training, you may even learn the value of doubt. You can certainly have religious beliefs and still be a good scientist; you can also be a good person and understand that people who disagree with your beliefs need not necessarily be evil, or even misguided. After all, most of the world's people - even the religious ones - probably think your beliefs are nonsense. They have a different set of beliefs, which you think are nonsense." Beliefs are formed through interaction of the brain with the person's surroundings, comparing new data with what is already known or believed. Complicity is the the chain of reactions that form that interaction, creating a unique experience between the two (or more). "Our senses are imprecise, and their inputs to the brain are subject to 'noise' - random mistakes. The workings of the brain, being evolved wetware (the organic material of the nervous system) rather than carefully engineered hardware or software, are also subject to errors. The signals that the brain sends to the body suffer from unavoidable variability." L-space links libraries across all space and time. The concept of a flat world leaked into roundworld, and that of a round world leaked the other way into Discworld. "What proportion of people do we need to be rational, to keep civilisation running? More to the point, these days: how many people does it take -gangsters or terrorists, bigots or zealots - to break down the workings of a civilised society?" "People live their lives, and are acquainted with all kinds of events, but for most people it's a small world. In an African tribe, there may be fasts and festivals, intimate relationships with about twenty people, mostly relatives, and a nodding acquaintance with about another hundred; just like Orthodox Jews in Golders Green, or Muslims in Bradford. Workmates, hobbyists, football supporters, pub acquaintances and friends can bring the total up to about 150. Humans seem to be able to remember about 200 faces, at most." "Since the beginning of recorded history, which is defined by the invention of writing by the Sumerians around 6000 years ago, historians have catalogued over 3,700 supernatural beings, of which 2,870 can be considered deities. So next time someone tells me they believe in God, I'll say 'Oh, which one? Zeus? Hades? Jupiter? Mars? Odin? Thor? Krishna? Vishnu? Ra...?' If they say 'Just God. I only believe in the one God,' I'll point out that they are nearly as atheistic as me. I don't believe in 2,870 gods, and they don't believe in 2,869." "The default is to disbelieve. An atheist is not someone who believes that God doesn't exist. It is someone who doesn't believe that God does exist. If you think those are the same, ponder this statement by the comedian Penn Jillette: 'Atheism is a religion like not collecting stamps is a hobby.'" "In both [embryological and cultural development], evolutionary changes occur through complicity between several programmes, each of which affects the future of the others. As time passes, each programme not only affects its own future by its own internal dynamics: it also changes its future by the changes it causes in the other programmes." "It [Science] replaces blind faith by carefully targeted doubt. It has existed in its current form for no more than a few centuries, although precursors go back a few thousand years. There is a sense in which "know" is too strong a word, for scientists consider all knowledge provisional. But what we 'know' through science rests on much more secure foundations than anything else that we claim to know, because those foundations have survived being tested to destruction."